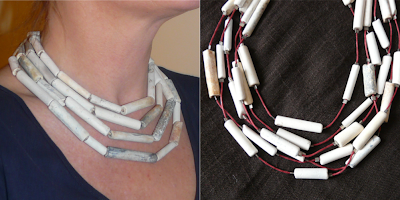 Amelia Parker's jewellery, cards and small accessories are created using fragments of clay smoking pipes collected from the foreshores of the River Thames. Many of the fragments date back to the 16th century and are used as found, having been eroded and coloured by time and tide over hundreds of years – they have not been trimmed to size or enhanced in any way. Commissions welcome. Personal visits and meetings available in London on request.... please contact me. More info and photos on the Facebook page – be sure to click LIKE / Follow !!! Why not join me for a walk along the River Thames? See here for ref of a previous gathering. Please note there are strict rules and regs about what you can do when accessing the foreshore. Many pieces have been created with men in mind such as bracelets, chokers, V3s with larger fragments, unusual single drops and, of course, cufflinks. 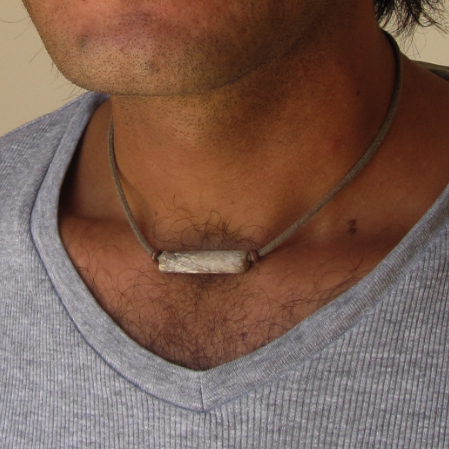 Men may like the idea that, when regularly worn, the jewellery will alter slightly in appearance and become less bright – the silver plate will tarnish and the fragments themselves will change in colour as they take on the skin's natural oils. For those who do not wear jewellery, how about a key ring, a card wallet or a mobile phone holder? 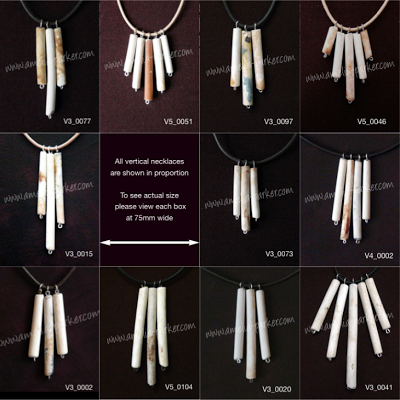 These are necklaces with pipe fragments interspersed with seed beeds (24 colours to choose from – see chart below) or crimped cotton cords (black, natural, red, blue, tan or green). Order a 60cm beaded necklace here. Longer lengths can be made to order. 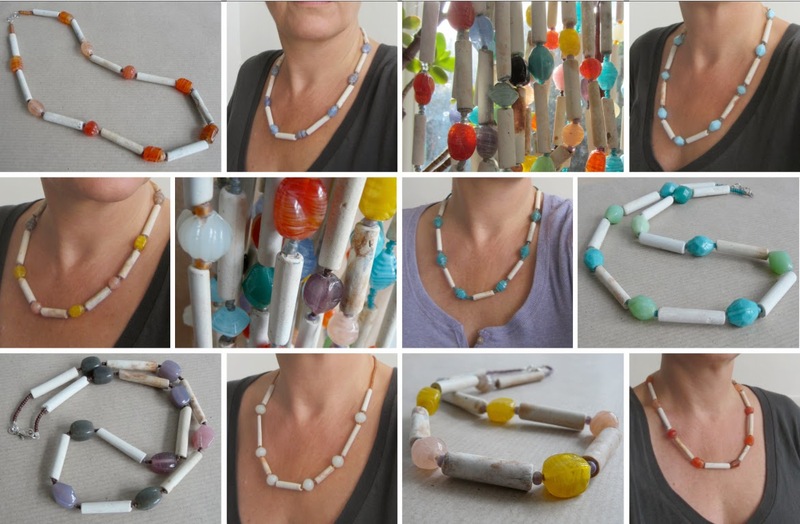 The images above, centre and right, show how a 150cm necklace is really versatile as it can be worn in many ways. The 60cm length is also available as a spectacle chain. 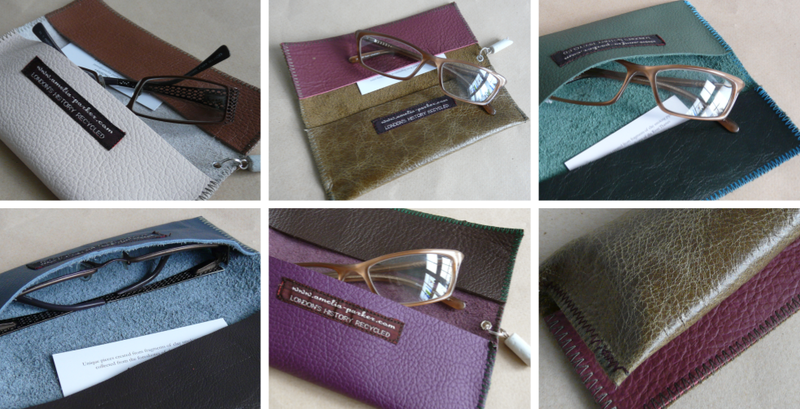 spectacle cases made from recycled leather also available. 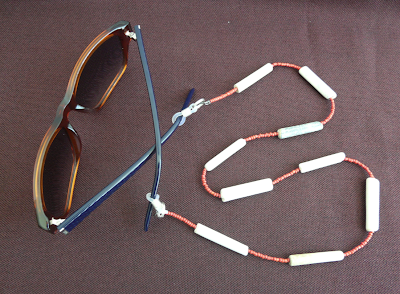 Beads and cords selection shown below – please enquire for further details as other colours may be available. 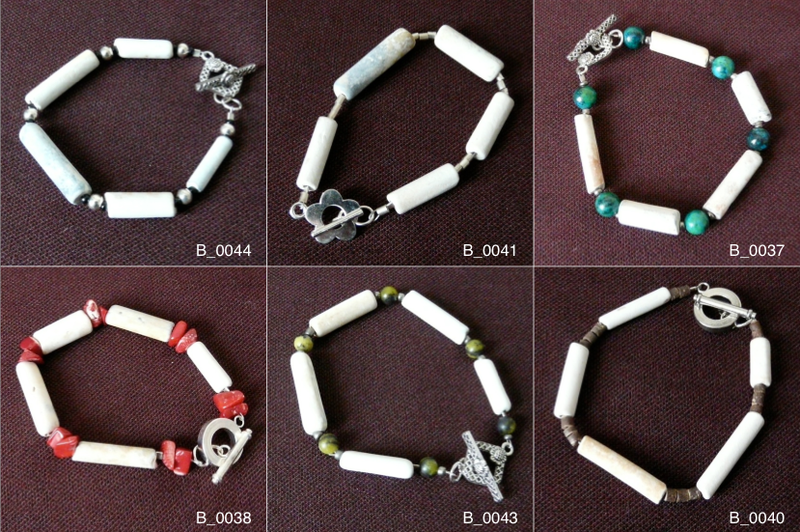 Beaded earrings and bracelets can be made to match. Please enquire. Some of the more interesting fragments that are nicely eroded, of an interesting shape, or with unusual patinations have been attached to 2mm black elastic cords. No fiddly clasps or catches! Available from my Etsy shop or to buy in person from the stall. 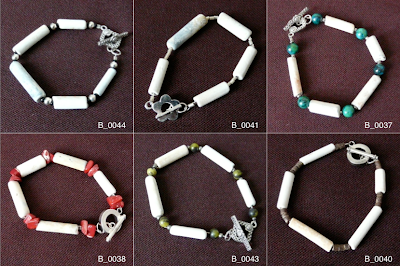 See also beaded and chain-linked bracelets. Larger statement pieces, similar to the vertical pendants with three or five fragments, are sometimes available. The longer fragments are harder to source and so available stock is limited. Check on Etsy for pre-made versions. The image below shows a necklace made using 25mm/1" fragments. 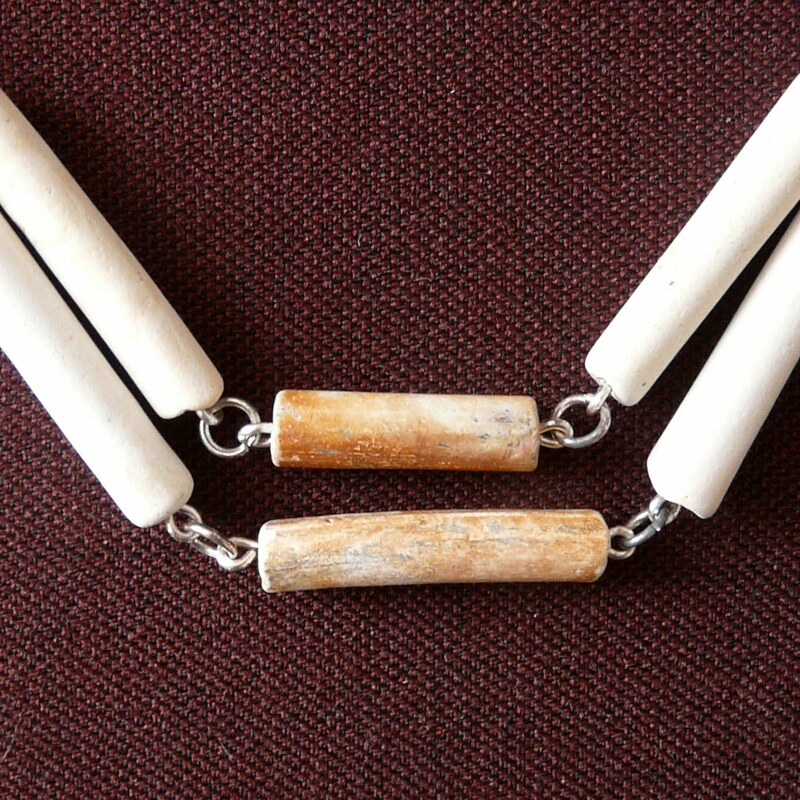 At 80cm/32" long, it is multi-functional as it can be worn in three ways – as a long necklace, as a double short necklace, or as a bracelet. Please note, this specific item is not for sale but similar necklaces can be made to order. Please enquire for details. 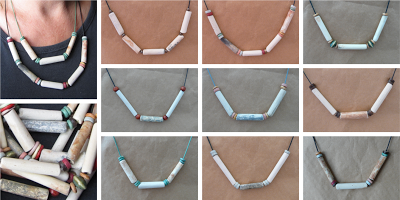 There are more items in this range – 2-chain necklaces, bracelets and earrings. 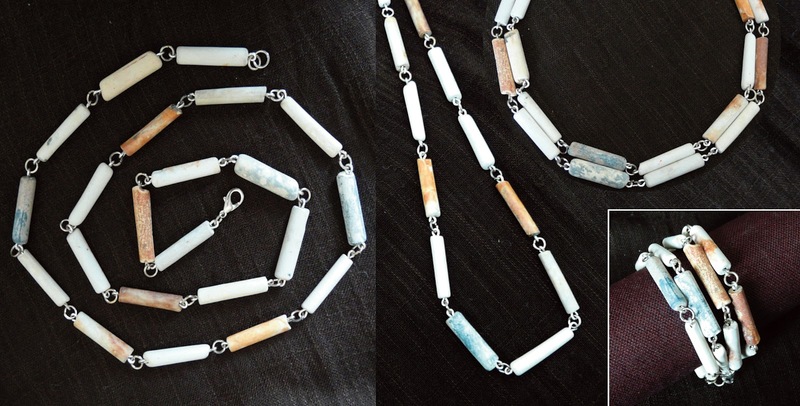 Statement pieces can make a great impact. Shown below left is a long length made from older fragments and worn four times around the neck for a tribal look. Below right is a red cotton strand approximately three metres long which can be worn in a variety of ways. 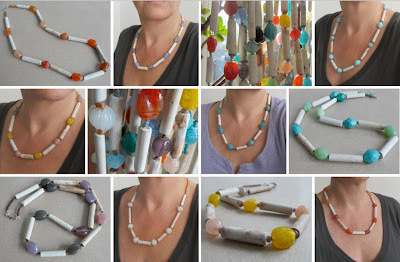 Or, why not send in your old necklaces or beads and have them transformed into something new and truly unique, as shown below...? Each one-of-a-kind glasses case is made from upcycled leather and features an internal pocket for cards (which further protects your glasses as, when full, it creates a rigid flap) plus a split ring where you can add your own keys alongside the clay pipe toggle. Available from the stall or my Etsy shop. Smart phone wallets/holders in three sizes. The glasses case is BEAUTIFUL! Thank you!! I love it! I want to order another for my fiancés mother as well. London Landmarks created with clay pipes. Postcard size (A6). Blank inside. 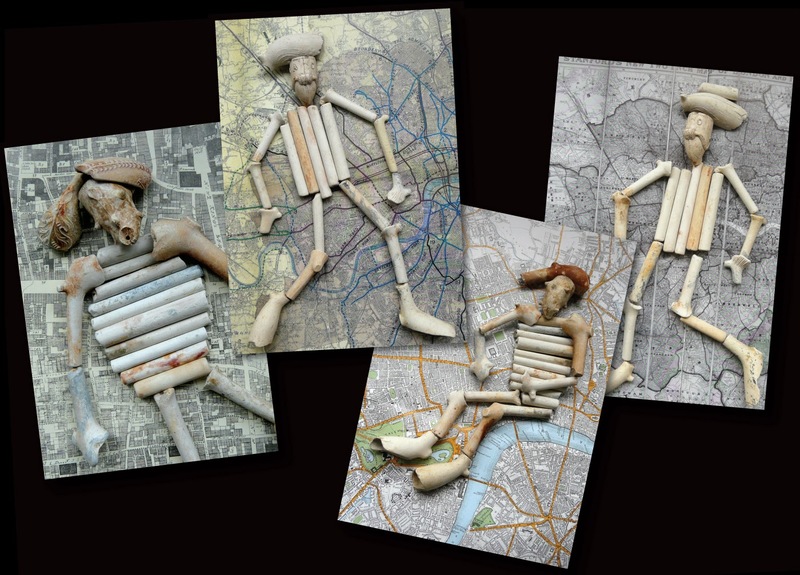 Please meet Clay Pipe Pete, an upright fella, and his lazy friend Smokey Joe. Overlaid onto old London maps. Postcard size (A6). Blank inside. 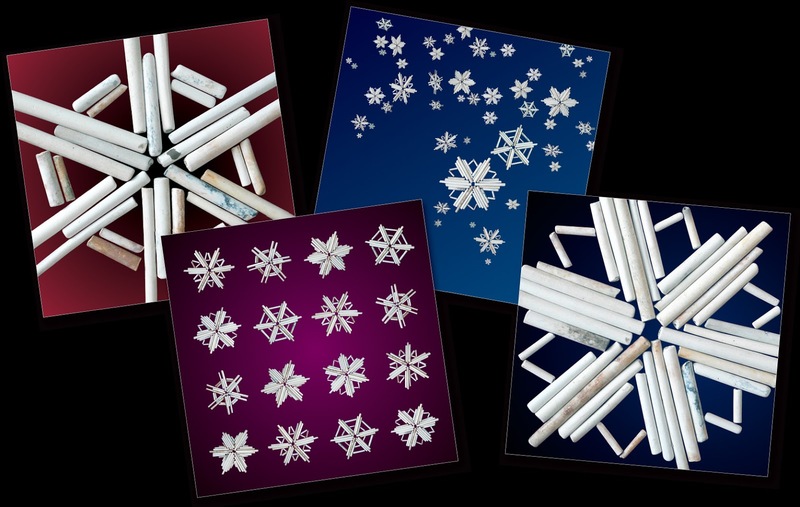 Christmas cards feature clay pipe snowflakes, trees and the 12 Pubs of London. See them all here. 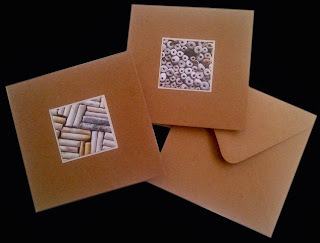 Textural arrangements of clay pipes are also available as handmade cards (blank inside). Buy through my Etsy shop or in person from the stall. Four, five or six fragments alternated with rows of seed beads. Pendant sections are approximately 30mm wide x 50mm tall. Please note that the image above is for indication only – the products shown may not now be available. Order through Etsy or buy in person from the stall. 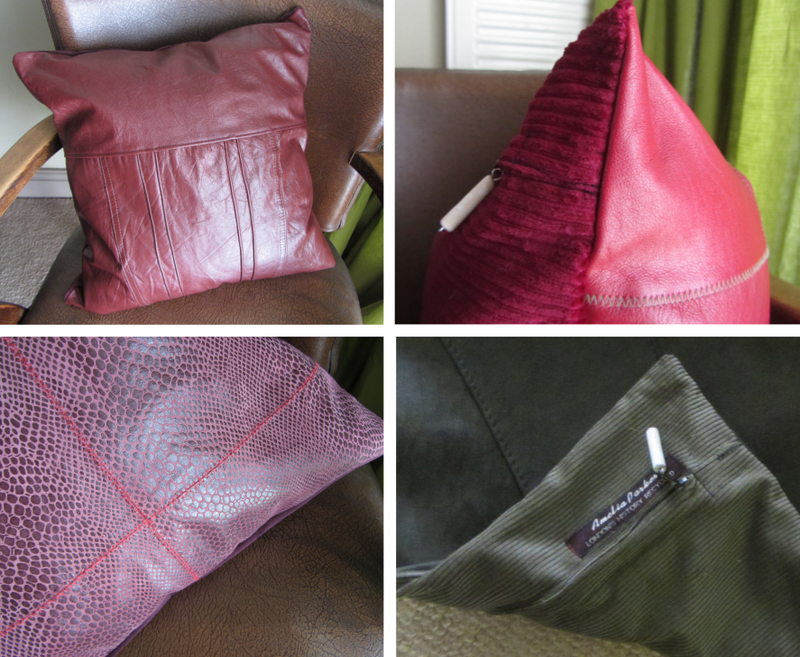 The leather range includes one-off cushion covers made from upcycled clothing and remnants. As with all my items, every one is totally unique depending on the size, shape and colour of the leather I have in stock at the time. 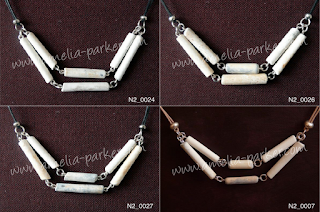 Each one is approx 16"/40cm square and has a material backing (usually cord or velvet) in a matching or contrasting colour, zip closure and a signature Amelia Parker clay pipe fragment as a toggle. Some have been created by making a feature of the garment's original stitching as per the image top left which used to be a coat. Others are patchworks. Donations of old leather clothing etc welcome – let me create something special for you – please see here or contact me for more details. All Christmas cards are available on Etsy and come bagged with envelopes. Please note, the image is a tree on a black background – the red shown here is not part of the card. 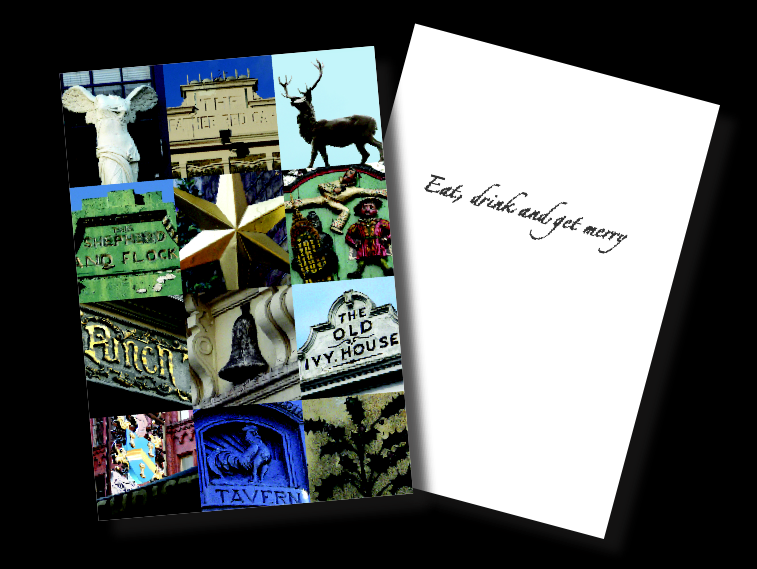 'The 12 London pubs of Christmas' a Jane's London creation – shows 12 pubs in London each with a tenuous link to Christmas. The message inside reads: "Eat, drink and get merry"). All cards available from my Etsy shop or in person from the stall. 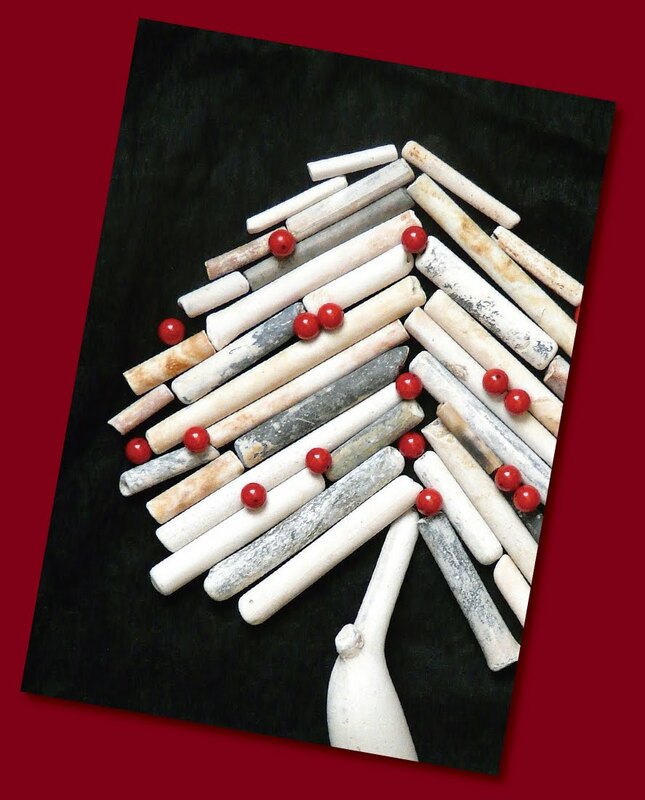 Decorate your Christmas tree with a unique clay pipe decoration. These stars have 5 pipe fragments with glass, semi-precious or 'silver' beads of varying sizes. Stock varies. Please enquire for details. Phone holders are available in three sizes and every one has a interesting clay pipe fragment on a split ring for you to add you own extra keys or charm. Small (130mm tall) fits most non-smart phones, plus smaller Blackberry and Samsung smartphone models. Medium (150mm tall) fits most iPhone4+5, plus many Samsung, Nokia, Sony and Blackberry smartphone models. Large (175mm tall) fits most larger models such as iPhone, Samsung Galaxy, Nokia Lumia, HTC One and many more. All feature internal pockets, one of which is clear – touch screens work through the plastic window. Available to buy through my Etsy shop or in person from the stall. 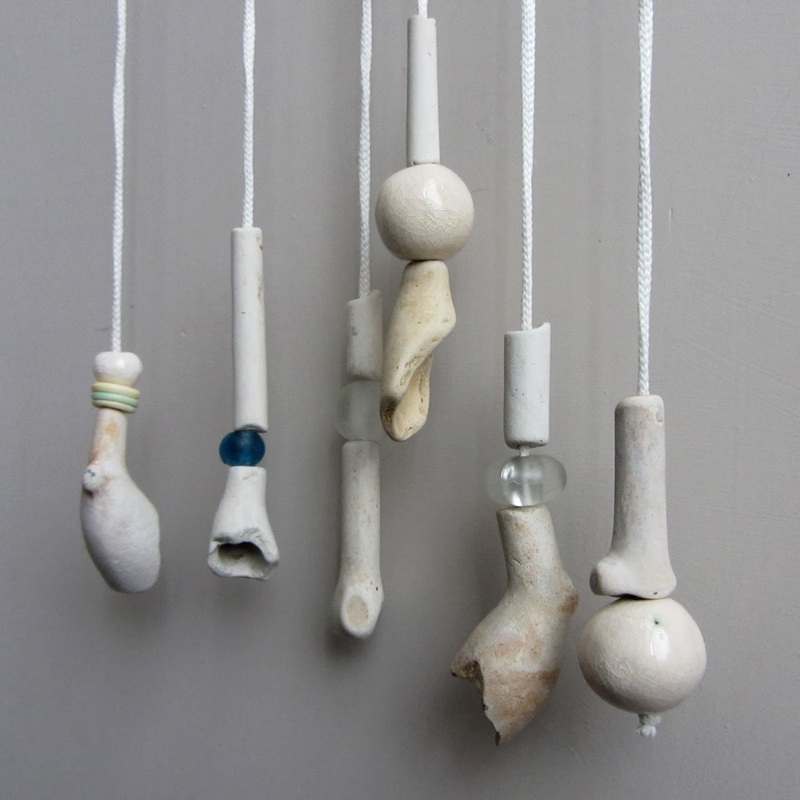 Interesting larger fragments, including broken and eroded bowls, have been mixed with large beads to create unique light pulls. So far, only available to buy in person from the stall – see market opportunities here. Please note that this image is for indication only – the products shown may not now be available. These wallets are great for credit cards, identity cards, bus passes, business cards, train tickets etc. 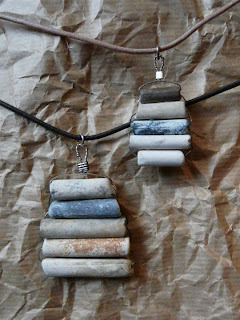 They have been created by recycling old leather clothes, swatch books and accessories. 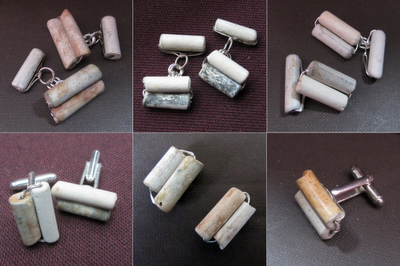 Every one is unique and features at least two pockets, one of which is clear, with a clay pipe on a split ring for keys or charms. Many more colours than shown here. See Etsy for more images. Also available on the stall. 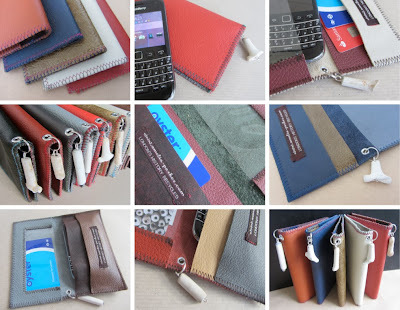 Smart phone wallets/holders also available in three sizes. 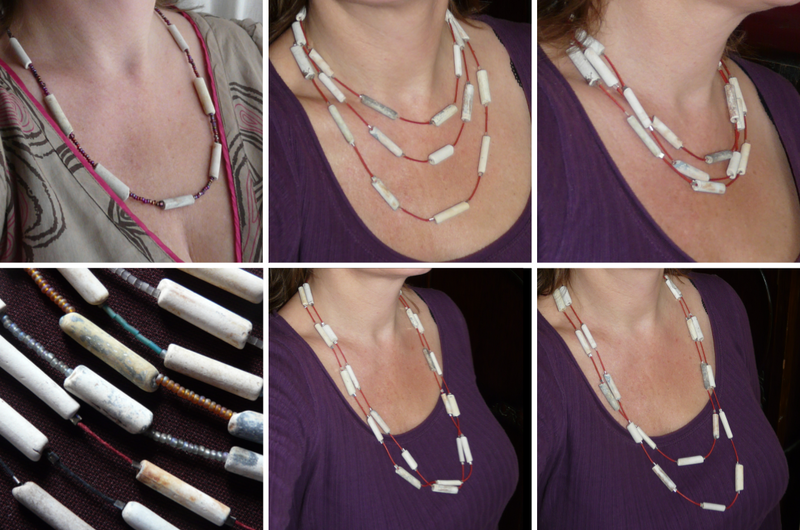 These necklaces feature three or five fragments separated by beads on 1mm cotton cord. The stock varies so please do get in touch regarding your preference. At the moment these are only available on the stall. Bespoke lengths can be made/changed to order. 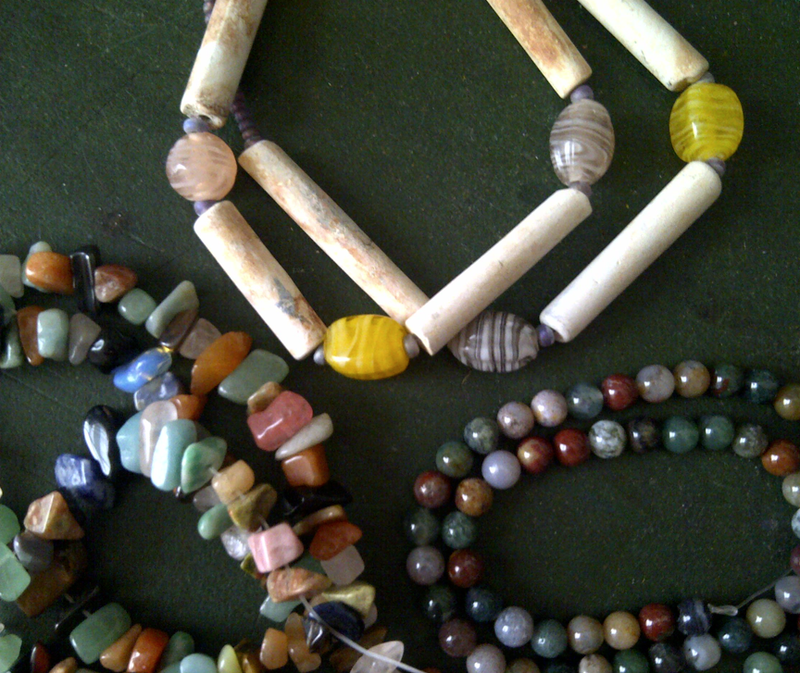 Bracelets can also be made to match using the same beads – please enquire. 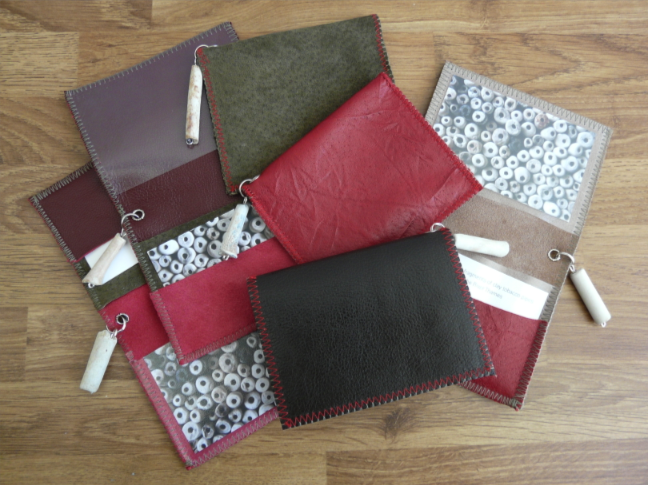 These change purses are made from up-cycled leather clothes, scraps or remnants. Each one features a velcro closure, and two internal pockets; one clear and one hidden behind the purse section. As per all other items in this ranges, each one is totally individual with complementary or contrasting colours, depending on what I have available at the time of making, and colourful zig-zag stitching. 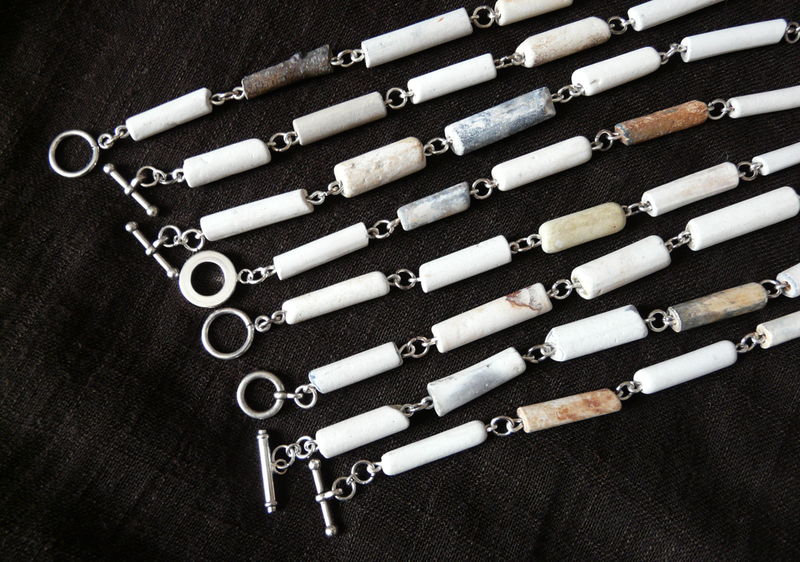 Each one has an Amelia Parker 'signature' clay pipe key ring/tag. This leather range is all made using recycled clothing, scraps, swatches or remnants. 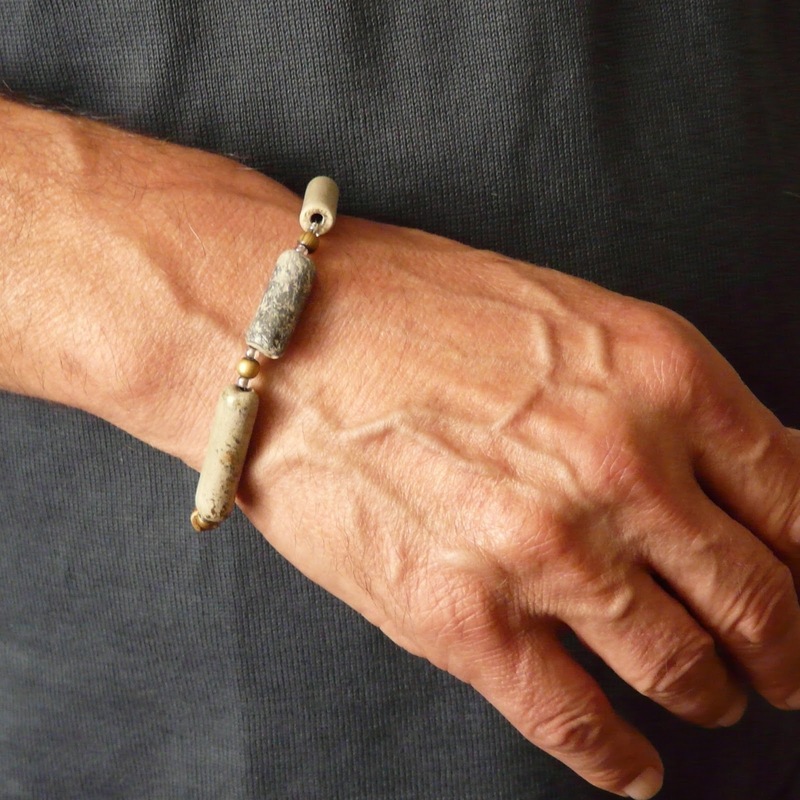 As per the jewellery and accessories, every item is totally individual depending on the leathers I have available at the time of making, and each one features a 'signature' Amelia Parker clay pipe fragment which is in itself a unique piece. If you have any unwanted or worn out leather/suede items that aren't really good enough for charity shops i.e. jackets and bags that are stained, ripped or have broken zips, even small items in brighter or unusual colours, then why not donate them to my recycled leather collection? 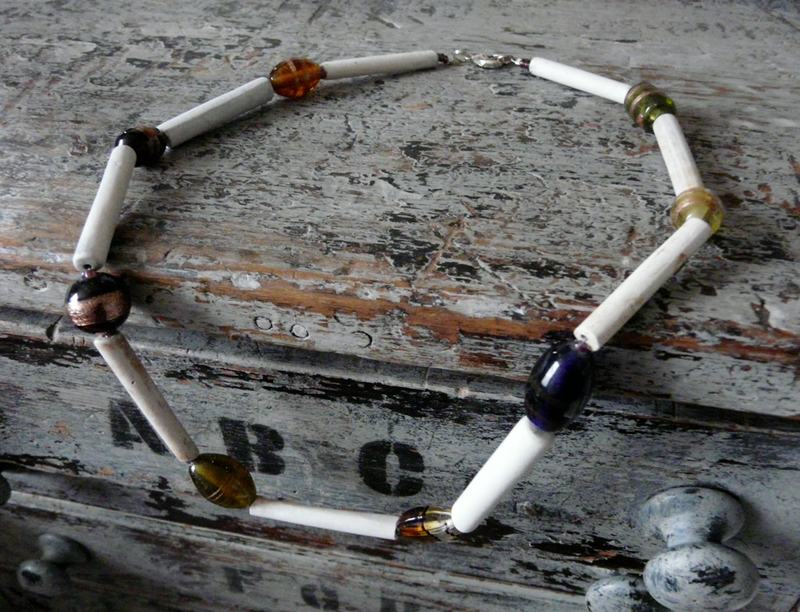 In return I will make you an item from the range so you can have a useful memento of your once-loved item. More info here on my Facebook page. Please contact me at jane@amelia-parker to discuss postage/delivery/collection. 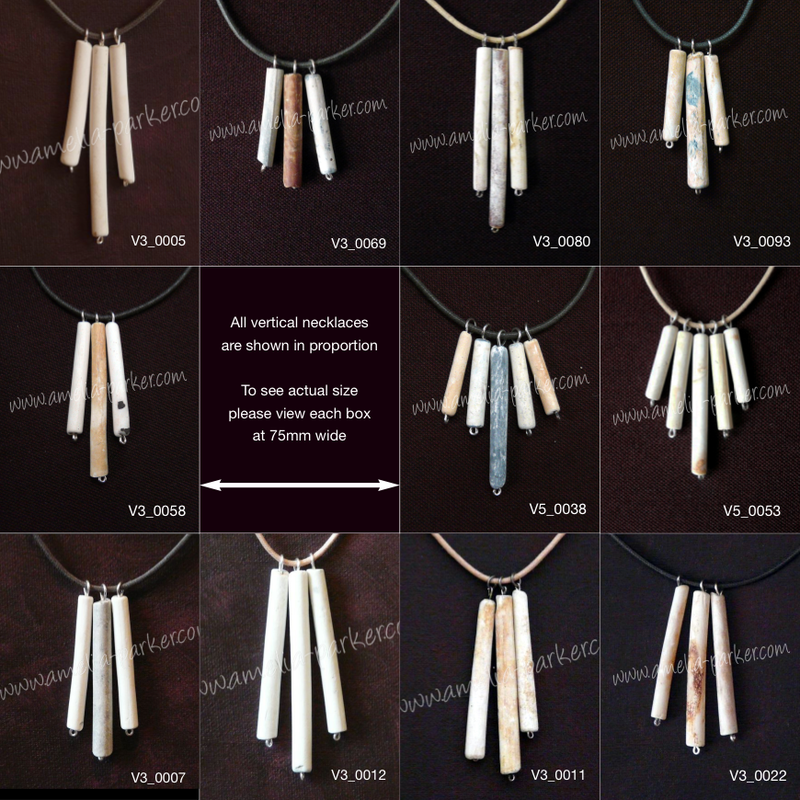 As shown here, pendant sizes vary due to the age and size of the fragments used. 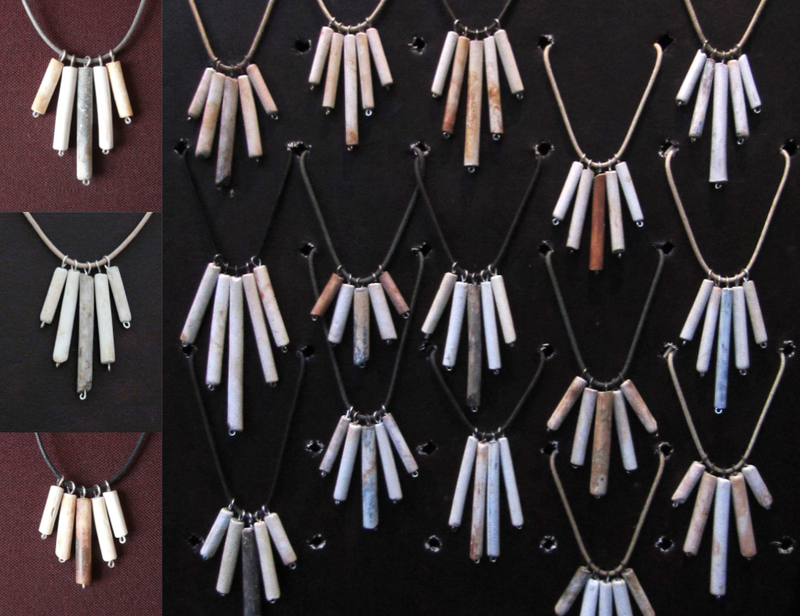 All horizontal necklaces are made by wiring 4, 5 or 6 fragments together to form a pendant using silver-plated copper wire and findings on waxed cotton cords. Cord lengths are approx 45cm, although they can be altered or made to suit. A selection of horizontal pendants can be found here. Made from two fragments that have been cut in half, sanded and sealed. This is the only product I make where the fragments have been in some way altered because matching pieces at this size are really hard to find. Available in two designs... with flip-backs (in stock) or chains (to order). A overview is shown above. Many more available on the stall. 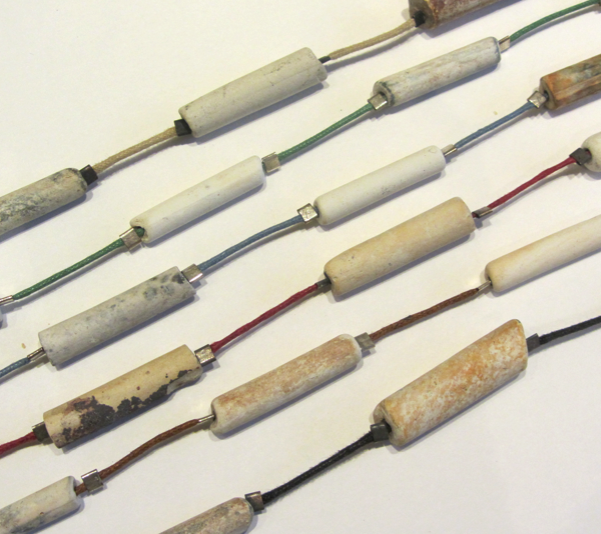 A photograph of available stock can be emailed to you – Please enquire for details. 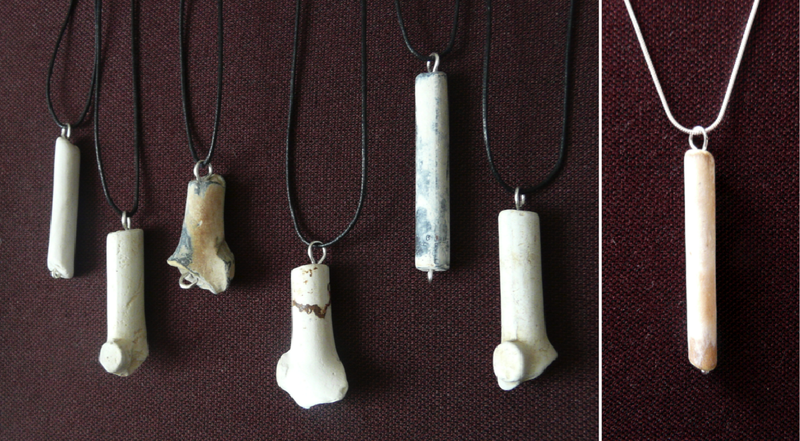 Long or unusual* fragments are available as single pendants on 50cm/18" 1mm cotton cords. 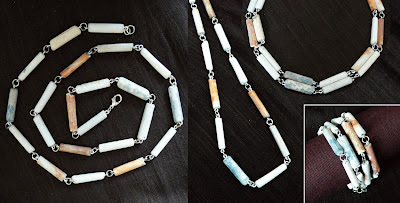 Other single pieces are also available as single items, looped ready for you add to whatever takes your fancy (no cords)... as pendants or bracelet charms, or to use as light pulls, zip toggles etc. Please enquire for further information. 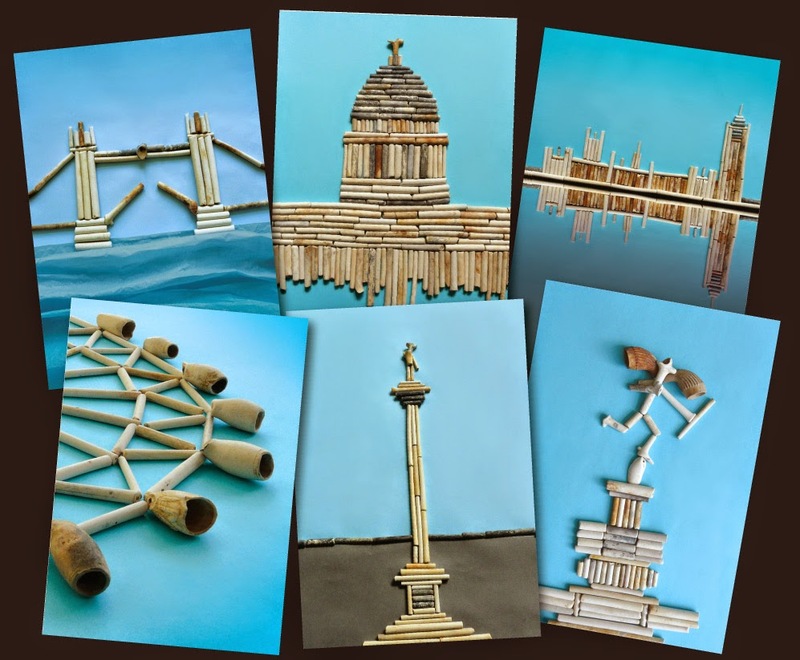 *The protruding round bits on some of these pieces are the bases/rests of the pipes. More info here. Please click on the image to view at a larger size. Silver plated findings on black or natural cotton cord with extension chains. One chain versions of these are also available. Please enquire for details. Please note these images are a guide only as all of the necklaces shown here are now sold. Available to order only. 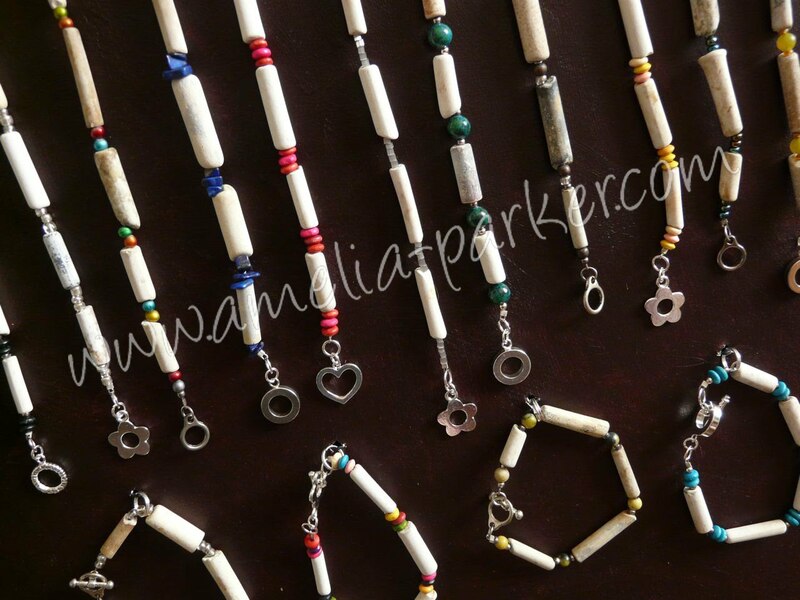 Also in this range – Matching bracelets, long chains and earrings.